Relax in the garden and enjoy the summer sun while this delicious sausage casserole with fresh herbs and seasonal vegetables cooks in the oven. Preheat the oven to 180°C, gas mark 4. Heat the oil over a medium heat in a large, wide flameproof roasting tin or casserole dish. 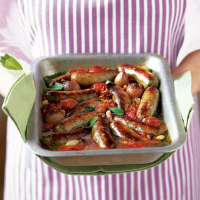 Cook the sausages in the tin or casserole dish for 5-10 minutes, turning regularly, until lightly browned all over. Remove the sausages and set aside on a plate. Return the tin to the heat and add the shallots, bacon and celery. Cook for a further 5 minutes, stirring occasionally, until the celery and shallots are just beginning to soften. Return the sausages to the casserole and stir in the tomatoes and stock. Place in the oven and cook for 30-40 minutes, stirring halfway through cooking if necessary, until the vegetables have softened. Roughly tear the basil and stir in. Serve with plenty of crusty white bread. To freeze, allow to cool thoroughly then place in an airtight plastic container and keep in the freezer for up to 3 months. Defrost fully before reheating.